We have updated our projected Federal Reserve timeline based upon outtakes from the last Federal Reserve Open Market Committee meeting in September of 2014. As a result of what we know, based upon what the Fed has communicated and what we contend (see summaries of each below), in addition to current economic data reports and forecasts, here is our current projected Fed activity timeline through the end of 2016. 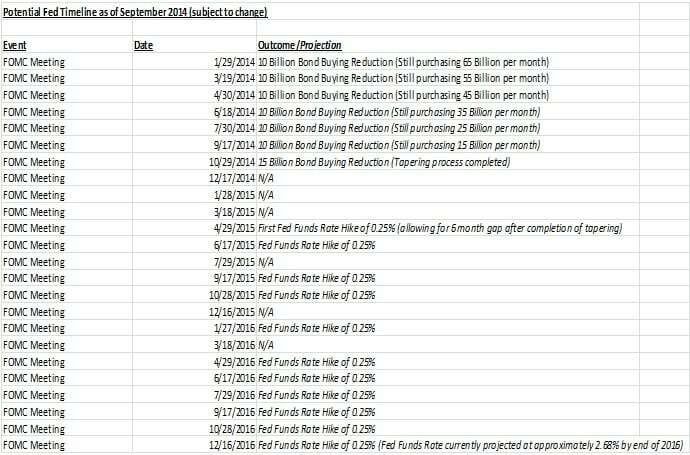 Please note: 2016 FOMC meeting dates are projected and not confirmed. 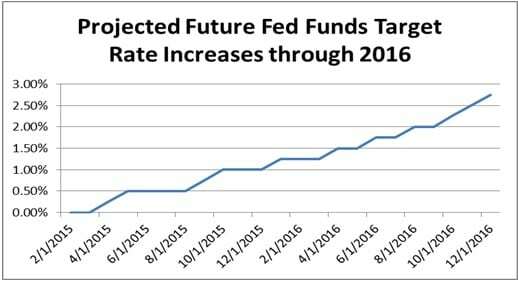 Fed Chair Janet Yellen said her expectation for the first increase in the Federal Funds Target Rate would come approximately six months following the end of the asset purchase program – through the infamous “tapering process”. The median rate forecast of Fed policymakers for the end of 2016 currently is 2.68% (which is the weighted average of voting Fed member targets as of September 2014 as per the chart below and may ultimately prove to be too aggressive), raised from 1.75% back in December 2013. Source: Board of Governors of the Federal Reserve System, Fed’s Projection of the Midpoint Target Range or Target Level, September 17, 2014. The Fed will continue on its current pace of a $10 billion reduction of its bond purchase program following the completion of each of its scheduled FOMC meetings in 2014. This would bring the tapering process to a close during the fall of this year – potentially in October. When it does begin to raise interest rates in 2015, we believe that the Fed will likely follow its blueprint that it utilized during the 2004-2006 tightening period when it gradually raised the Federal Funds Target Rate on 17 different occasions in 25 Basis Point (e. 0. 25%) increments over this timeframe. This gradual, drawn-out tightening remains appropriate, in our view, given the Goldilocks state of the U.S. economy which is not “too hot” to warrant a shorter tightening timeframe or larger increments of increases and not “too cold” where the Fed would consider additional stimulus measures including, but not limited to, maintaining current record low interest rate levels for an even further extended period of time. All of this depends upon the economy continuing to show signs of consistent growth in the months ahead to allow the Fed to feel comfortable beginning their highly anticipated tightening process. To this end, the International Monetary Fund (“IMF”) recently cut its global GDP growth estimate to 3.3% for 2014 and 3.8% for 2015 citing concerns over a weak recovery in Europe. On the flip side, the IMF revised their GDP targets upward for the U.S. to 2.2% in 2014 and 3.1% in 2015. According to the IMF, accommodative monetary policy, favorable financial conditions, strengthened household balance sheets and a healthier housing market are all expected to help support economic growth in the U.S. in the months ahead. These forecasts coincide with our previously mentioned Goldilocks analogy such that if economic growth hovers “around 2%” for too long or dips below 2% this would then fall into the “too cold” camp and may require the Fed to alter its tightening activity timeline. Disclosure: The information provided is not an invitation to invest in any products or services or otherwise deal in any of these or enter into a contract with Hennion & Walsh or any other company. The information provided should not be relied upon in connection with any investment decision. You should not act upon any information contained herein without first consulting a suitably qualified financial or other professional advisor.